Court historians have long praised the glories of Alexander Hamilton as the greatest of the founding fathers. This view is back in vogue as U.S. economic policy becomes ever more statist. In this dazzling work of revisionist history, Professor Thomas DiLorenzo provides the other view. He shows that Hamilton is the architect of most of today's failed economic policies: protectionism, central banking, and debt. His core principle is that government should be used to benefit the rich and privileged, mostly through its power to print money and run financial scams. 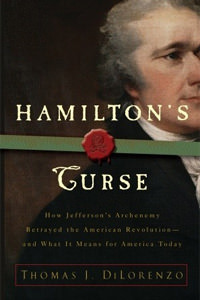 In this sense, Hamiliton's Curse has been visited upon the United States in the 2008 bailout of powerful investment banks. Hamilton was the master of the political lie. He used his rhetorical powers and elite connections to invent the myth of the Constitution’s “implied powers.” He established the imperial presidency. He devised a national banking system that imposes boom-and-bust cycles on the American economy. He saddled Americans with a massive national debt and oppressive taxation. He pushed economic policies that lined the pockets of the wealthy and created a government system built on graft, spoils, and patronage. He transformed state governments from Jeffersonian bulwarks of liberty to beggars for federal crumbs. Moreover, DiLorenzo shows that Hamilton, as compared with Jefferson, was an economic ignoramus. Whereas Jefferson was schooled in a classical liberal tradition and revered the legacy of A.R.J. Turgot, Hamilton was an old-fashioned mercantilist who thought that barriers and debt were the keys to prosperity. Thank goodness that a master economic historian has finally answered all the hysterical pro-Hamilton propaganda that has been inflicted on us. This is a book that every believer in American liberty must master. This is a wonderful history of the US as viewed through the lens of the conflict between Hamilton's and Jefferson's visions for America. DiLorenzo successfully makes his case that while we celebrate Jefferson, we live in Hamilton's America. It's interesting to see that the very things Americans debate today such as the meaning of the General Welfare and Interstate Commerce clauses of the constitution were being debated since Washington took office. The book is well written, readable and thoroughly sourced. If I had to point out one weakness it's that DiLorenzo fails to point out that the expanding power of the federal government was very likely inevitable even without Hamilton. It's kind of hard to scapegoat one man when government, by it's very nature, attracts power-hungry men like Hamilton to it and has done so since the constitution was ratified. This book really shows how Hamilton manipulated the Constitution to give the Federal Government almost unlimited powers. It exposes Hamilton for what he really was. Hamilton was not a friend of liberty, but a mercantilist and an imperialist. DiLorenzo brilliantly shows the sorrowful consequences of Hamilton's ideas.